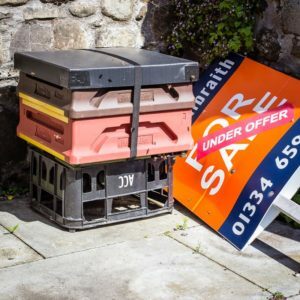 This bait hive – formed from two poly nuc supers under a cheap-as-chips* Correx roof – was put in a sunny corner of my garden in Fife on the 8th of May. 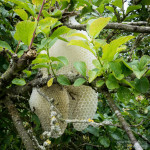 The first scout bees were noticed early on the morning of the 22nd and built up strongly over the bank holiday weekend. A large swarm arrived on the afternoon of the 30th … far better here than the church tower or somewhere else inaccessible. It’s worth noting the time between the appearance of the scout bees and the arrival of the swarm – just over 9 days. This is almost exactly the time it takes for a sealed queen cell to be produced from a newly laid egg. However, swarms usually leave the originating colony on the day the queen cell is sealed (assuming good weather) and hang about in a bush or tree while deciding where to set up home. Assuming that the first scout bees I saw were from the swarm that finally arrived (for which I have no evidence, other than the rather low density of beekeepers in this part of Fife) I suspect the colony probably swarmed a day or two before the 30th … which still means that the scouts probably started their quest for a new home well before the queen cell was sealed. 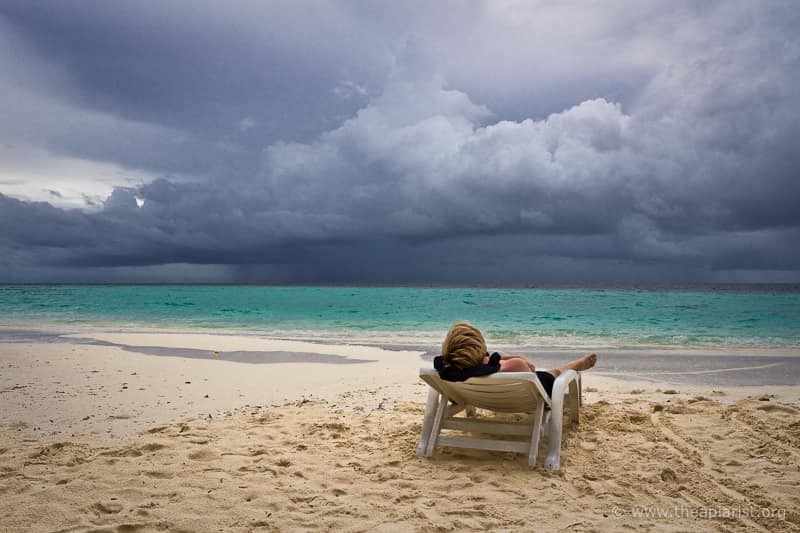 Whatever … freebees, what’s not to like? * actually, cheaper than chips … these Correx roofs cost about £1.50 each whereas a portion of chips at the outstanding Cromars fish and chip shop in St. Andrews is £2.10. And highly recommended. This entry was posted in Beekeeping, Swarms and tagged bait hive, Correx, swarms on June 5, 2015 by David.